Seen here living up to his name. Once, he was called Phillip M. Provost; but in recent years, you're more likely to have met him as Jason Wright, or Derrick Attell, or Marcus Quinn, or one of a hundred other names. His true identity, though, is Chuckles: undercover G.I. Joe agent, reporting to Hawk on the criminal organisations of the world; a task that he's naturally suited to with his gregarious charm and ruthless willing to do whatever's needed to complete his mission. As an undercover agent, Chuckles is not officially on file as a member of G.I. 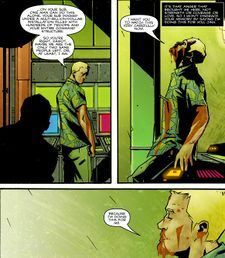 Joe; instead, he contacts the Joes through his handler Jinx, with whom he's begun a romantic relationship with. Recently, he's discovered the existence of a global terrorist conspiracy called Cobra, and is infiltrating it as a prospective agent. What could go wrong? At the tavern, Chuckles feigned disinterest, not wanting to seem too eager, but when he denied that an American counterterrorism group had been targeting him, his interviewer lost faith and moved to leave. This forced Chuckles and the Joes to use their backup plan: a G.I. 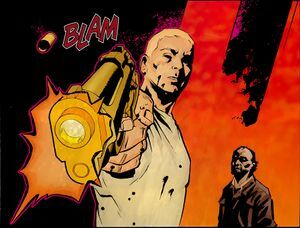 Joe team burst into the bar in a raid, and in the ensuing firefight, Chuckles "shot" Scarlett and Heavy Duty with a blank-firing gun synced to exploding blood packs worn by them, before helping his interviewer to flee the bar. Escaping in a stolen paramilitary truck, the lieutenant — impressed with Chuckles' "killing" of the American special forces — offered him a second interview before leaving. 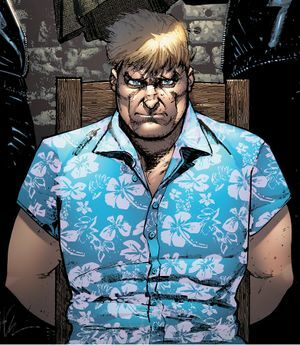 Over the following three weeks, most of what Chuckles did for Cobra amounted to simply acting as a driver and bodyguard for his employer, "Mr. X". Though he believed he was on the verge of a breakthrough, when he met with Jinx in a "gentleman's club" to update her, she revealed to him that direct communication had been deemed too dangerous: their meeting would be their last, and that further communication would be made only through his SR receiver. His routine would only change four weeks later when Skelton, rather than his usual partner Semyon, met him in the car with an assignment to collect Mr. X from the city center; en route, though, the car was caught in an ambush by well-equipped attackers, who shot Skelton dead and used a rocket launcher to destroy the car. Chuckles managed to escape at the last second, sending the wreckage of the vehicle into the ambushers, but worried over what he was going to say to X. The kindling of his relationship with Erika put Chuckles at rest, and he was able to sleep easier alongside her. 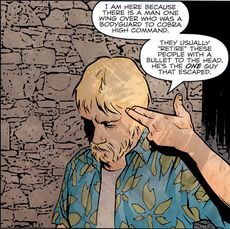 His peace of mind didn't last long, though, as his participation in the destruction of a delivery train with eleven people on it — and his allies' executions of their informants — made him doubt whether his mission was really doing any good; regardless, his orders remained the same: record, observe, and don't break cover. 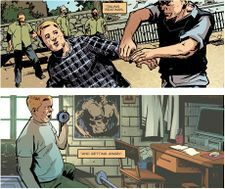 When assigned to rescue dissident scientist Anatoly Naryshkin from a prison transport, Chuckles and Semyon were faced with multiple prisoners claiming to be their target; but one of them — a prisoner brought on in an unscheduled stop — revealed a suicide belt which exploded, hurling Chuckles back and seriously injuring him. Over the three weeks of Chuckles' recovery that followed, he came to realise that the explosion had damaged his SR receiver, as he was no longer receiving any messages from headquarters; Erika visited him frequently, though she only acted in a professional context except when certain that nobody was observing. 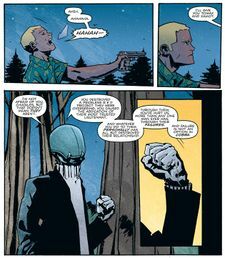 Shortly after being released, Chuckles was summoned by Mr. X, who revealed that the agent would no longer be "wasting" his talents in the Balkans; instead, he was to be reassigned to Cobra's central office in Dubai, serving as head of security for Erika and "head of special projects". This role turned out to range from combat operations to prisoner interrogation to training Crimson Guards; something that Chuckles was uncomfortable with, but rationalised as a necessary sacrifice to get him as close as possible to the top. Erika, meanwhile, attended weekly meetings with their mysterious, permanently-hidden "commander", leaving Chuckles wondering whether there was truth to the talk of her relationship with the man in charge. Wondering to Erika when the promised "special projects" would appear, she responded by questioning whether his heart was really in the job. As "head of special projects", Chuckles was assigned to work on Cobra's latest military endeavour: battle automation tactics, in the form of robotic soldiers nicknamed BATs... which were, unfortunately, unable to tell friend from foe and liable to self-destruct, with both of Chuckles' predecessors as project lead having been killed by them. Though Chuckles' assistant Max was optimistic about their improvements to the AI, the Joe warned him against being overconfident, given Cobra's tendency to dispose of those who couldn't deliver on their promises. Meanwhile, the spark had gone from Chuckles' and Erika's love life, leaving only dull routine; as she left in the evening, Chuckles suspected that it would be the last time he would see her, but couldn't bring himself to say goodbye. The next morning, Chuckles entered Cobra's main building, and attempted to convince Semyon, standing guard, to allow him in to see Mr. X. When the man refused, Chuckles paused to compose himself, before hurling Semyon through the window of X's office. Drawing a pistol, he escorted X at gunpoint to the office of the mysterious "commander". Though X warned of dire consequences if he proceeded, offering him a clean death in its place, Chuckles demanded that he open the code lock. Inside they found Erika, and the "commander" with his back to the door... who turned around, revealing the face of Mr. X. He revealed to Chuckles that his name was Tomax, and that the man that Chuckles had brought to the room was his twin brother Xamot; Cobra's real commander had never been anywhere near the Dubai headquarters. 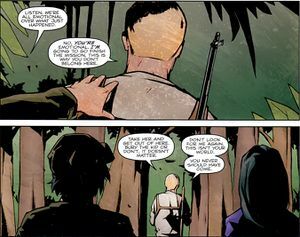 Returning to Xamot's room, Chuckles took Tomax — still recovering from being knocked out by his brother — as a hostage, escorting him back to the Commander's room at gunpoint. 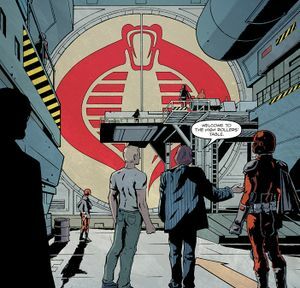 Showing him the Commander's body, Chuckles explained that he needed Tomax to help him to access certain areas in Cobra's installation; his isolation from high command and the fact that his brother had tried to kill the Commander meant that he was out of allies, and nobody would question Chuckles. 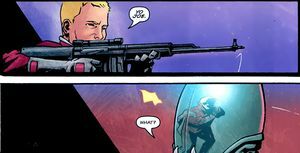 The strategy worked, until the two came across Big Boa; Tomax immediately blurted out the truth about the Commander's death, and upon Boa realising that he was telling the truth, Chuckles was forced to fight him. 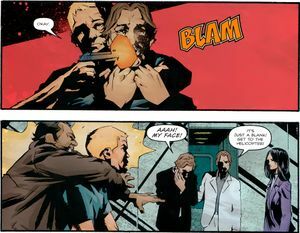 Boa effortlessly stripped the slide from Chuckles' gun before he could shoot, and proceeded to severely injure him while Tomax escaped; Chuckles was forced onto the ground, but managed to kill Big Boa by stabbing him in the neck with the gun's slide in a lucky shot. This page was last edited on 28 February 2018, at 23:51.